Precious metals futures ended mostly lower Friday but they advanced on the week. Silver stretched its weekly wins to two in a row. 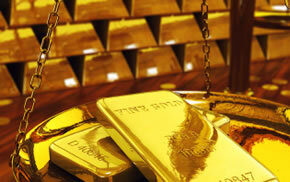 While gold dipped from a two-week high on Friday, the yellow metal snapped a string of three weekly losses. Gold for June delivery shed $1.60, or 0.1%, to settle at $1,320.70 an ounce on the Comex division of the New York Mercantile Exchange. "Geopolitical risks in the Middle East, a weaker dollar and softer Treasury yields are giving gold a temporary boost," Reuters quoted Walter Pehowich, executive vice president of investment services at Dillon Gage Metals. Gold futures traded 0.5% higher this week following three weekly declines that had trimmed prices by a combined $33.20 or 2.5%. On Thursday, they settled at their best price since April 27. The precious metal is 0.9% higher on the year so far. "Nineteen market professionals took part in the survey. Fifteen of the respondents, or 79%, called for gold prices to rise over the next week. There were two votes each, or 11%, calling for gold to fall or be sideways. Meanwhile, a larger-than-average 2,491 voters responded in an online Main Street survey. A total of 2,207 respondents, or 89%, predicted that gold prices would be higher in a week. Another 185 voters, or 7%, said gold will fall, while 99, or 4%, see a sideways market." Falling for the first time in three sessions, albeit very modestly, silver for July delivery dipped a bit more than a half penny, or 0.04%, to close at $16.752 an ounce. Silver futures advanced 1.4% this week after rising 0.7% last week. They are still 2.3% lower on the year to date. July platinum edged up 80 cents, or 0.09%, to $925.90 an ounce, for a 1.7% weekly increase. Palladium for June delivery declined $8.70, or 0.9%, to $985.20 an ounce, reducing its weekly gain to 2.9%. Both metals are down on the year with losses of 1.3% for platinum and 7.1% for palladium. Gold gained $5.55, or 0.4%, to $1,324.35 an ounce. Silver rose 16 cents, or 1%, to $16.76 an ounce. Platinum added $3, or 0.3%, to $926 an ounce. Palladium climbed $13, or 1.3%, to $1,004 an ounce. In weekly LBMA results, the gains reached 1.1% for gold, 2.1% for silver, 2.8% for platinum and 4.3% for palladium. Gold bullion coins advanced by 6,500 ounces this week after they climbed by 1,500 ounces last week. Splits included 2,000 ounces in American Gold Eagles against 1,000 ounces previously and 4,500 ounces in American Gold Buffalos against 500 ounces previously. American Silver Eagles rose by 50,000 coins this week after they moved up by 230,000 coins last week. Sales of five-ounce silver bullion coins were muted for a third straight week.